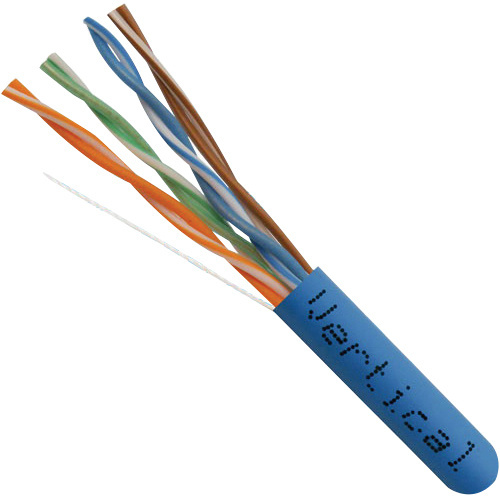 Vertical Cable 23/4P UTP CMP Plenum-rated Cat 6 patch cable has 5.334-Inch Dia blue flame-retardant PVC jacket to withstand harsh environmental conditions. The 0.203-Inch brown/brown/white FEP insulation resists electrical leakage and offers protection against environmental threats. It has 100% layer 1 Duofoil® tape aluminum foil-polyester tape/85% layer 2 braid tinned copper shielding that reduces EMI/RFI interference/crosstalk. This bare copper cable has voltage rating of 300-Volts. The 1000-ft cable of diameter 0.573-Inch, has bend radius of 0.75-Inch. It has 5.6 pF/100 m mutual capacitance, 100-Ohms +/-15% impedance and 9.38-Ohm/100 m resistance. This cable withstands temperature range of -20 to 75 deg C. It is suitable for high-speed data applications, fast Ethernet and 155Mbps TP-PMD/CDDI. Cable is ETL listed, RoHS compliant and exceeds TIA/EIA 568-C.2 specifications.